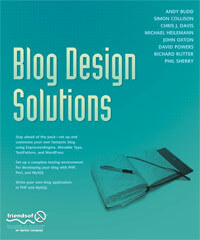 I just read Blog Design Solutions which is a book that quickly walks you through creating a blog. The book covers the popular blog engines and goes in depth about customizing each. This book will help you save time if you plan to create a blog. It starts out quite simply and that’s ok because as you delve deeper and read the chapters that interest you you’ll find an amazing wealth of information. This book was a combination effort by a number of bloggers. They are: Phil Sherry, Andy Budd, Simon Collison, Michael Heilemann, Richard Rutter, David Powers, Chris J. Davis, and John Oxton. The extent of talent wrapped up in this book is stunning. Imagine if one person tried to cover all of the blog engines out there. It would be impossible. This approach works. It’s for anybody that hasn’t mastered their particular blog engine and wants to learn more. It includes all of the basics like installing a blog and setting up your testing environment to design and coding ideas. It even touches on some CSS basics. Rather than learning by trial and error, I think if you read this you just might save some time. I primarily work with WordPress and I found that chapter particularily interesting. I learned a new trick reading this book. Did you know that you can create vastly different layouts in your category archives by simply saving off separate category pages? For example, for the Best category I could create a file named category-18.php into my WordPress theme folder and immediately without any further customization that category could have a different layout. The number that you enter refers to the category id number (found in the WordPress Edit Categories page). That’s pretty cool. Here’s some info on the WordPress Codex about Category Templates if you want to read more. I’ve heard people say that ExpressionEngine is very nice and so I found it interesting to read about the process of setting it up. I would really love to use it for a project. A similar process was outlined for Movable Type and Textpattern. A couple of times I thought the book got off track however in the end I noticed it was each author putting his own spin and sharing his process for building a great blog. If you haven’t delved into customizing a blog before and you want to save some time — even if you have — get this book. I could have saved hours had I read this book a year or two ago. If only for the great material about WordPress. It does have some portions that are more basic yet really shines when educating about customizing and designing a great blog. Sounds like a good read. I’m most interested in reading up on the local test environment chapter. Do they outline for both Mac and PC? I’ve also a WordPress fan. I’ve started to play around with it over the last few weeks. So far every kind of feature I’ve wanted to add somebody has already released a plugin for. Life is good – It almost codes itself! Yeah, this is a wicked book which is easy to read and has simple examples that pack a heavyweights punch. A must for any aspiring blogger. I am looking forward to the next edition to see what else they decide to share. In answer to the above question, yes, it does take you through set up on PC AND Mac. I believe my company and solid record of my employees achievements can be a helpful for your company. We have over 4 years of professional Experience in Book Exterior & Interior Design etc. You can hire our fulltime employee for only $590/month (6 days/week/8:00 am – 5:00 pm). Please contact me at “contact@datastyling.com” if you need further information about our company.